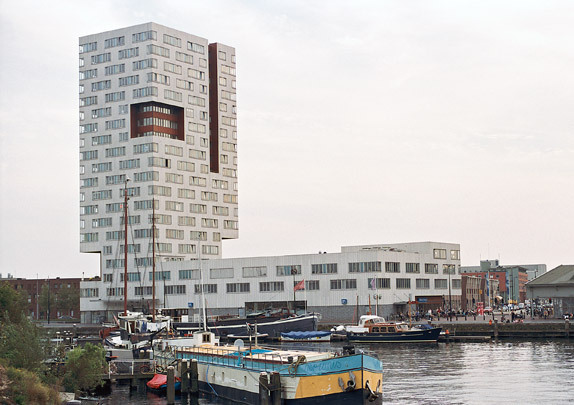 The IJ-toren or Y Tower nestles in the crook where the quay of Oostelijke Handelskade meets the dam connecting it to KNSM-eiland (Verbindingsdam) and marks the new residential district. Sixty metres tall, the tower contains 68 apartments in 16 different types. The rectangular volume has a variety of incisions cut in it, giving it a monumental, sculptural aspect. A plinth-like horizontal volume given over to shops and parking is on axis with a retained former warehouse (Brazilië) also containing shops. The tower is clad with fibre cement sheeting picked out vertically by aluminium cover strips, with reddish-brown timber panels for the incisions.